Attendance is FREE, but registration is required. Note: Attendees must bring a personal computer. 4 books will be raffled among attendees: 2 copies of “Techniques that Use Speech, Observation and Empathy: Qualitative Research in Action ” and 2 copies of “Content Analysis Supported by Software”. 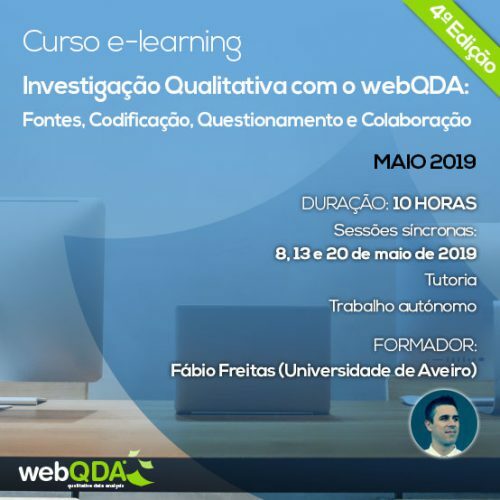 This training session will cover the following topics: reasons to use qualitative analysis software; expectations when using webQDA; organization and potential of webQDA; introduction to webQDA features; document system (Sources); cases and attributes. Coding procedures; system of categories (Codes); How to relate data and Codes to build models. The importance of questioning to extract the required information from webQDA (Questioning). What is the meaning of the analyzes carried out and the results obtained? What is the consistency of the coding throughout the data analysis? 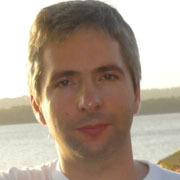 Pattern exploration in matrices; Elements obtained from webQDA that support the writing of the results of the analysis. Furthermore, we will demonstrate how to use webQDA to streamline the Bibliographic Review process and optimize results. Literature review is an activity transversal to all research projects. From the definition of the theme to the results, the researcher needs to perform, improve and update continuously. 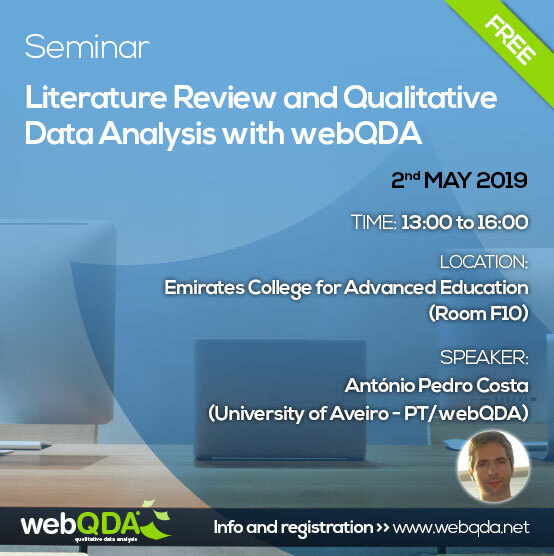 In this context, webQDA has recently implemented some features to optimize literature review, allowing the researcher to import their metadata through bibliographic reference managers or directly from databases. After import, webQDA automatically sorts the metadata by author, publication type, year, and keywords. Identifies the duplicate metadata and makes it possible to exclude, by a simple click, those that are not intended to be analyzed or do not fit the study. With these results, it is possible to generate a conceptual map. Generate and export concept maps. Introduza o seu email e receba informação sobre futuras formações, eventos e outros assuntos.